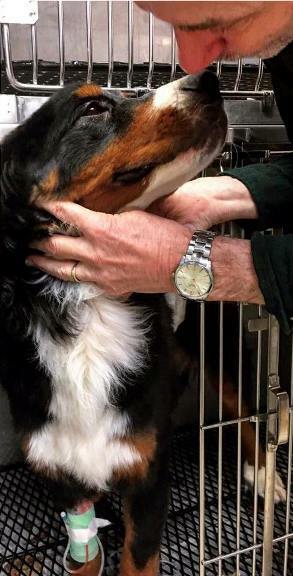 Ollie the 9 month Bernese Mountain Dog came in to our clinic for continued vomiting and overall lousiness. He also happened to have a history of not discriminating when it comes to food...he felt that corn cobs and watermelon rinds were part of a well-balanced diet. Upon his first visit, Ollie was still a bouncy puppy, but his owners expressed that he definitely was not himself, and had been having intermittent vomiting. When medical therapy did not seem to help Ollie's condition, we became more and more suspicious about a foreign object inside of Ollie's GI tract. 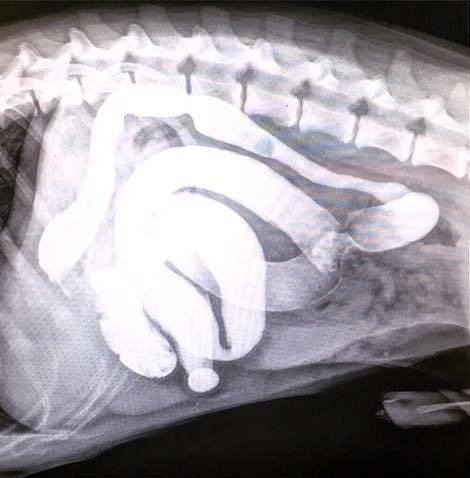 "Foreign body" is the term we use for any abnormal item that an animal might ingest - tennis balls, rubber toys, socks, hair-ties...you name it, and it probably has been found by a veterinarian at some point! We are most suspicious about foreign bodies in puppies especially, because they are so curious about their environment and like to explore with their mouths - which means eating all kinds of things! Ollie definitely fit this signalment, but theoretically any animal can be a foreign body candidate. Foreign body cases often present with an inability to keep any food or even water down - they tend to vomit several, if not multiple, times over the course of a day. They also often will act sick, but Ollie fooled us a little bit with his happy disposition at first, so they can present in several different states. The best way to diagnose a foreign body is with x-rays, but we also recommend bloodwork to monitor how sick the animal is really feeling as well, if their electrolytes are unstable from vomiting, and if any specific organs are affected. Regular x-rays are helpful, but doing a contrast study with liquid barium, as show in the picture above, is incredibly useful when suspecting an obstruction, as it shows up radio-opaque (white) on radiographs and allows us to follow the GI tract through a series. On Ollie's barium x-rays, we felt as though the intestines were more dilated that normal (typical of a foreign body radiographic "pattern"), and that the barium suddenly stopped on its way through the small intestinal tract. This study confirmed that we needed to go in and find the foreign object causing obstruction. Sure enough, our surgery revealed a corn cob stuck in the intestines which we promptly removed. 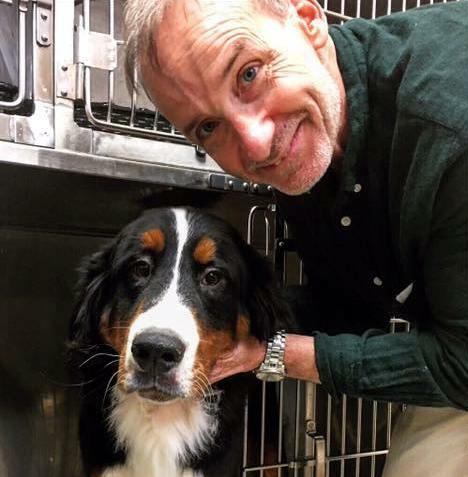 We always check the health of the GI tract while we are in surgery, because the longer an object is stuck in the GI tract, the more risk it poses to normal tissue, and can cause necrosis (tissue death). "Happy" intestines are nice and pink - intestines that are damaged can look maroon or even purple - when this happens, we perform a procedure in which we remove the damaged section and attach the remaining healthy ends together. Luckily, Ollie did not have any signs of necrosis. Ollie recovered beautifully from surgery and has since regained his normal bouncy attitude. The most important progress is that he finally was able to keep down his meals; he was very hungry after not being able to really eat for a few days! We are so happy we could help you out, Ollie! !